It is in the little details - the chalk line around the removed corpse, along side the comment that the head was found some way from the body. Then you look again at the chalk mark that was made around the murder victim and then it registers that this was a decapitation. The comment that The Hands foot soldiers turn to ash when they are killed. Like I said - Little things, those tiny details that keep this title a rich and endlessly interesting one. 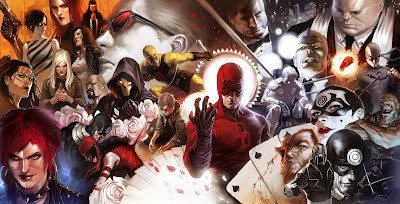 It mixes the 'normal' life of Matt Murdock (which has completely crumbled into chaos) and the extraordinary life of Daredevil adeptly. You cannot see the join, there is no jarring of styles. The whole title is swathed in dim light, a grainy haze where the good get 'got' with depressing regularity, and the bad survive and thrive. Against this, Daredevil (and in the periphery, the likes of Frank Castle (aka Punisher)) pursue their agendas, vendettas and/or fight for right. In this issue, as we near the end of the 'Return of the King arc, new alliances are forged while others crumble away, and it is this latter development that poses a threat, unknown to those who believe to be working with others for a greater good. What I am trying to say is that Daredevil adopted a high risk strategy in deciding to ally himself with his greatest enemy. On top of that, all whom he loves are in very real danger. So its high tension time, each scenario right on the edge of blowing up. Then the issue ends, with the promise of issue 500. 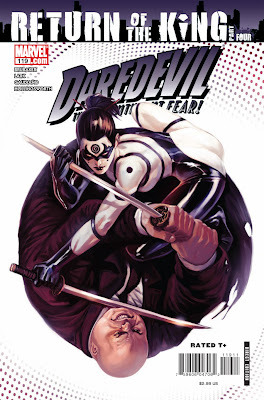 If I had to review this issue purely on its own merits, I would say that the come-on (in this case, the cover depicting a Lady Bullseye / Kingpin face-off) was a lot more exciting than the actual experience, but the quality of the title is so strong that you are completely immersed anyway.